The key light is Alien Bees 800, left, through a 32x48 softbox, 1/2 power. Right fill provided by another AB800, about 1/8 power, through a PCB White High-Output Beauty dish. Behind the subject to the left and right, are LumoPro 160s through Honl snoots, providing rim/separation light (1/4 power or 1/2 power). The coach is standing front of a black muslin background. It had wrinkles, but good light control and the background blurring effects of being so tight with the 50mm lens made them disappear. My cheap eBay background stands are losing their ability to hold things up, so I guess it's time replace them with something good. 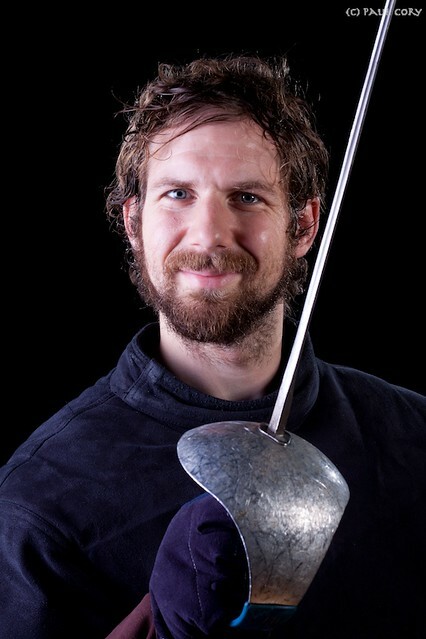 Taken at the Mid-South Fencing Club in Durham, North Carolina.